I’m leading the Denver Google Analytics Meetup tonight, and we’re going to be talking about dashboards. Sharing a summary here for the Meetup, and anyone else who wants to get started with dashboards. At the bottom of the post there are links to some great template dashboards, free for download in the Google Analytics Solutions Gallery. What’s good about dashboards is that they are simple and easy to share with clients and/or stakeholders. In particular, I love the email capability. You can schedule a dashboard to be sent to a client as a PDF weekly or monthly. You look like a hard-working genius, while GA does all the working and geniusing. What’s bad about dashboards is that they strip away many of the features of dynamic reports in GA – you don’t go to a dashboard to investigate, you go to get a quick update. You can build your own from scratch too, but I like starting with a template. 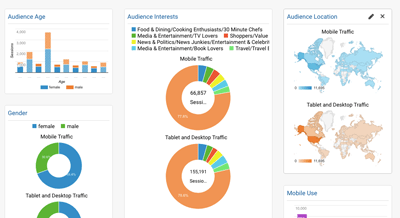 Trying out different templates is also a quick way to see what is possible in dashboards. Or go to the Google Analytics Solutions Gallery directly – it’s a bit easier to filter by ratings, categories and other dimensions from here. Change the date range. This is kind of obvious, but I often forget to change it when I pull a dashboard up. The default is the last 7 days, but you typically want to see at least a month. You can also compare the current date range to previous. Add segments to compare mobile vs. desktop, paid vs. organic, etc. Add filters to widgets to narrow in on really specific questions. For example, you can create widgets that compare the performance Android and iPhone visitors, or sales regions, or languages, or specific campaigns, and so on. Make template dashboards your own. Starting with a template is easier than starting from scratch, but I can almost always make a dashboard more useful by tweaking, adding and removing widgets. What it’s good for: high-level overview. What it’s good for: understanding your audience. I like how simple and visual it is. This one becomes a lot more interesting if you use the compare-date-range feature. What it’s good for: understanding where conversions are coming from. What it’s good for: analyzing content. What it’s good for: analyzing technical site performance. What it’s good for: seeing how much traffic is coming from social media to your site. It is also a great example of how you can use filters to make a dashboard focused on a specific visitor attribute.